Four days off work means big celebrations, and we've arranged the biggest of all. 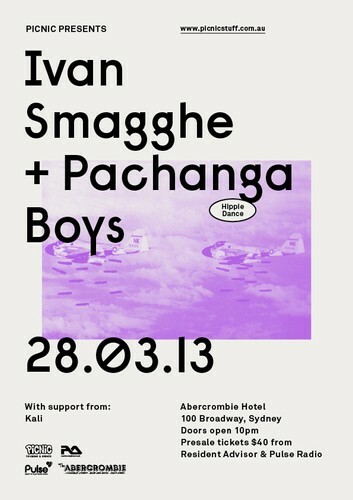 Picnic are proud to present a night at The Abercrombie Hotel with Ivan Smagghe and Pachanga Boys. Seriously. Dunno if the Easter Bunny works the same way that Santa does, but you've all been good boys and girls and we think you've earned it. Ivan Smagghe: It may be more time efficient to talk about the things that Ivan Smagghe hasn't done than the things that he has. Smagghe's remarkable musical intuition has made him one of the world's most respected and sought after acts, both in the studio and behind the decks. With one of the deepest record bags in the business, his sound is never the same from one moment to the next, yet it's always distinctly Smagghe. Pachanga Boys: The purveyors of love, joy and the power of Pachanga: when Superpitcher and Rebolledo joined forces back in 2010 the world became a more partyful place for everybody. Their Hippie Dance imprint, a sub of Cologne powerhouse label Kompakt, was born out of the perfect partnership between a German master of shimmering techno and grooving house and a Mexican oddball whose releases on Matias Aguayo's Còmeme celebrate a humorous, fun-loving approach to dance music. Together, the pair have put out three unbelievable 12-inches, including 2011's 15 minute massive euphoric burning odyssey 'Time', and their recent debut LP 'We Are Really Sorry' which was a huge favourite of 2012 for dancers and DJs around the globe. The Hippie Dance Atelier Super Limited Collectors Edition of the album included a 36 page psychedelic coloring book with special crayon pack, a postcard to send the one you love and an organic cotton and Alpaca knitted tortilla chip broche - yeah, they're pretty fun dudes. Peace, Love, Power and Pachanga! It'll be Ivan's first visit in 7 years and the debut of the Pachanga Boys in Australia, so this is a very special occasion!